I decided it was time to stop neglecting my science blog. I’m hoping to post more regularly. For now, I have a few older things I’ve done with my girls to share, and some new project ideas in the works. 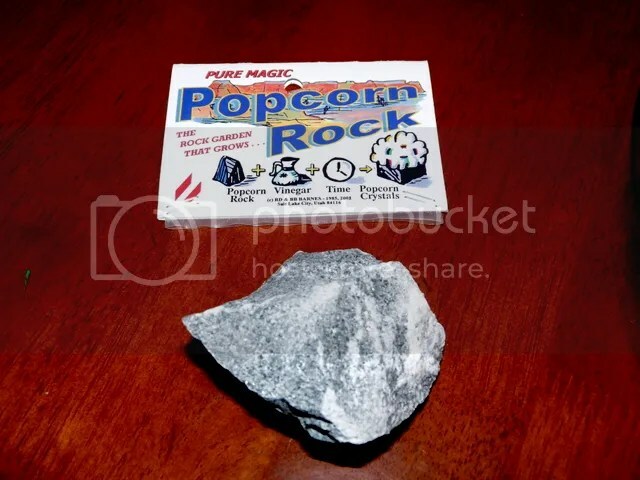 When we were at a science museum once, I decided to pick up Popcorn Rock. 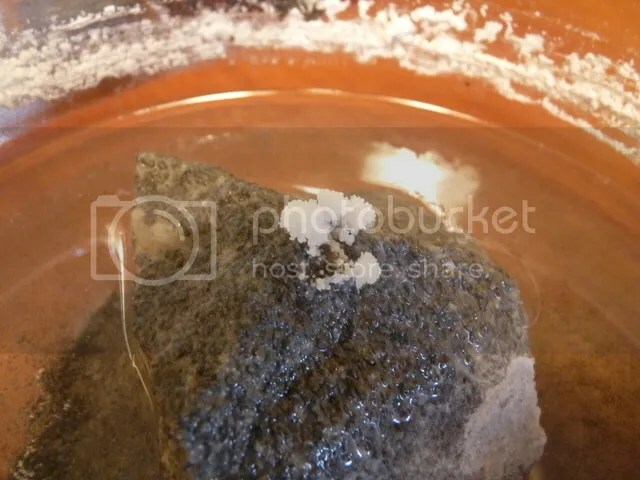 This is a sample of Dolomite (a sedimentary mineral made out of calcium magnesium carbonate) that grows Aragonite crystals when placed in a bowl of white vinegar. It’s probably the easiest investigation ever. 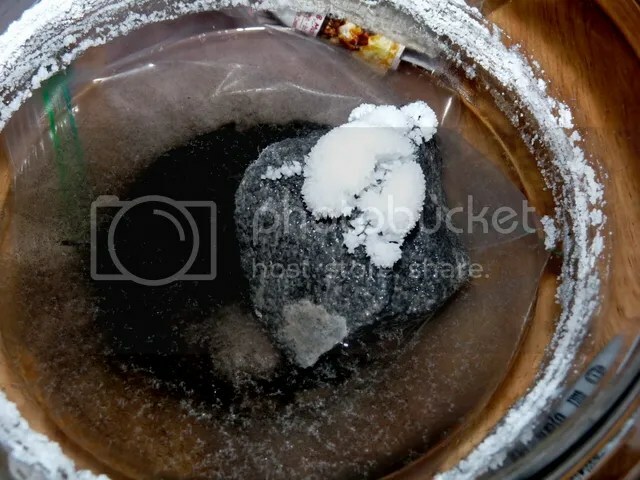 Even way easier that the sugar crystal growing experiment we did. 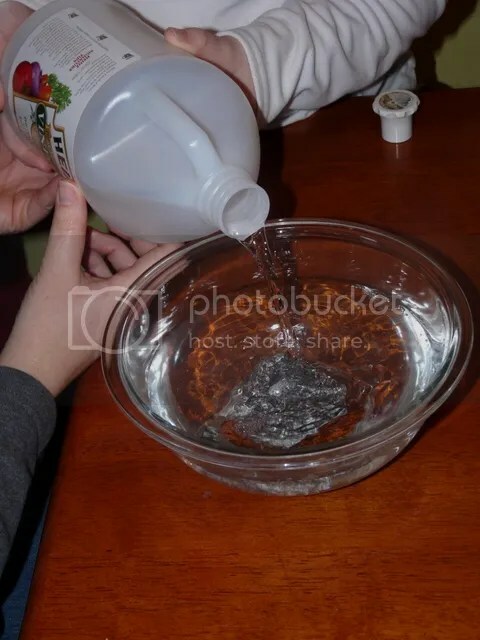 Just open up the package place it in a bowl (ours was glass), add vinegar and wait. For us, it took a little over two weeks to start seeing our Aragonite crystals. Nothing really happened until the vinegar evaporated. To understand what’s going on, I found this article from Educational Innovations on Crystal Growing Dolomite. The rocks contained in this package are magnesium rich dolomite. Dolomite is an evaporative sedimentary rock made up of a variety of sediments and minerals. This dolomite is actually somewhat unique in that it possesses an amazing property that is not necessarily common to other dolomite samples. When placed in distilled white vinegar, this dolomite grows beautiful white aragonite crystals. This characteristic was first discovered in 1981 by Mr. Richard D. Barnes, then a geology student at the University of Utah, who was working with fossil specimens of horn coral that he had collected. Typically, horn corals are preserved in limestone, a rock that is composed of calcium carbonate, which reacts with vinegar and dissolves in that weak acid so that the fossil can be removed and studied. 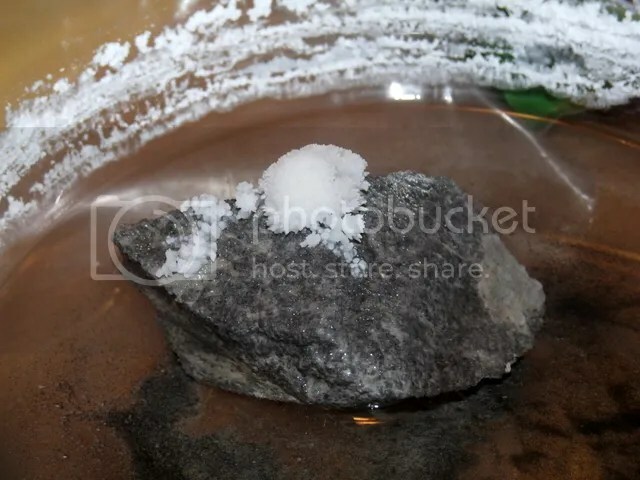 The interesting thing about this rock is that is did not dissolve but rather produced spectacular, white, bulbous crystals, resembling popped kernels of corn. 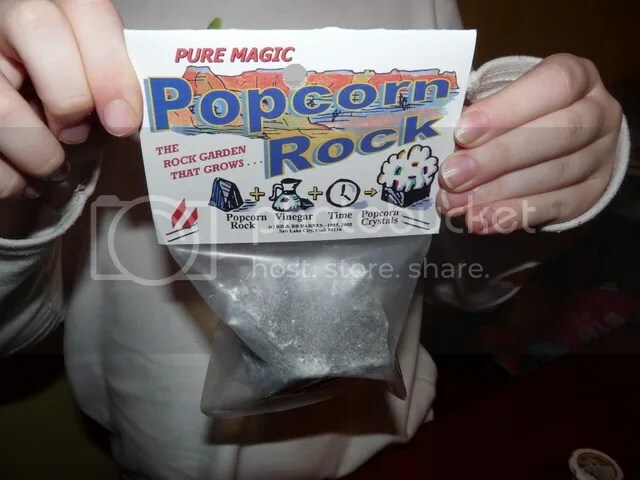 That is how these rocks came to have the commercial name, popcorn rocks . In going back to the site, Mr. Barnes determined that this rock layer was actually an ancient lagoon that had been surrounded by a coral reef millions of years ago. He attributes the unique, crystal growing property of the rock to the residual minerals deposited in the rock layers by sea grasses that were present in the lagoon at that time. “The smell of a flower – The memory of a walk in the park – The pain of stepping on a nail. These experiences are made possible by the 3 pounds of tissue in our heads…the BRAIN!! 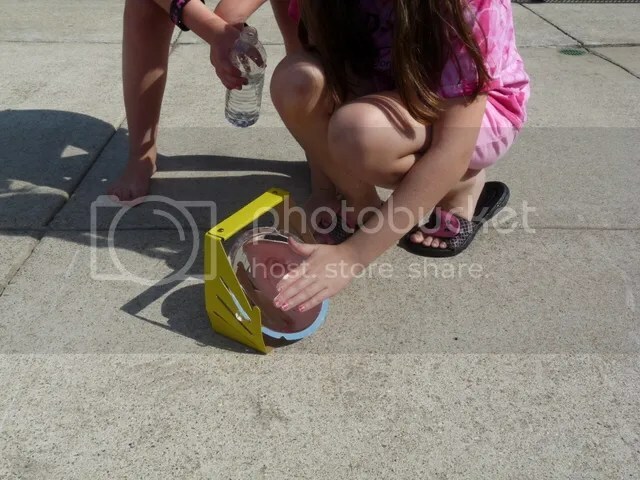 But yesterday, my daughters and I went to the park with one of their friends and I decided to take along one of our science kits I’d been meaning to try out. 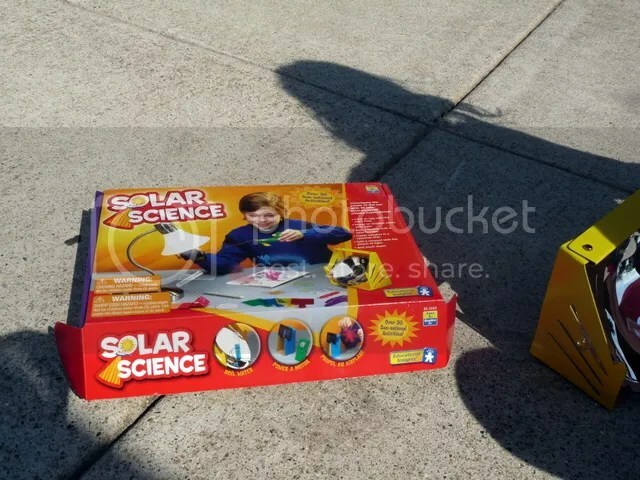 It was a solar science kit. 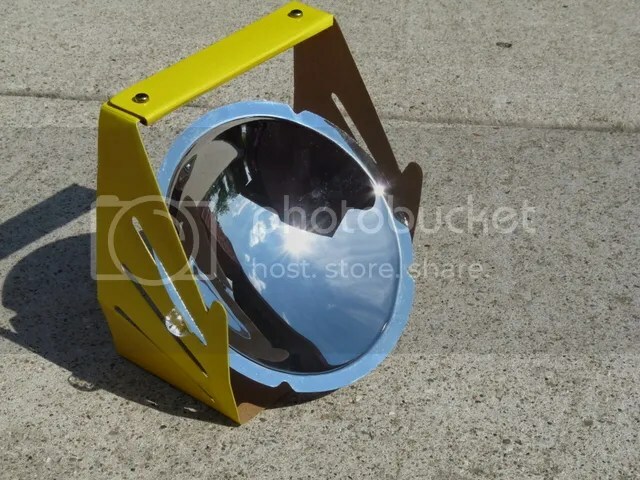 I decided to have the kids try out the Solar Furnace. How does work? 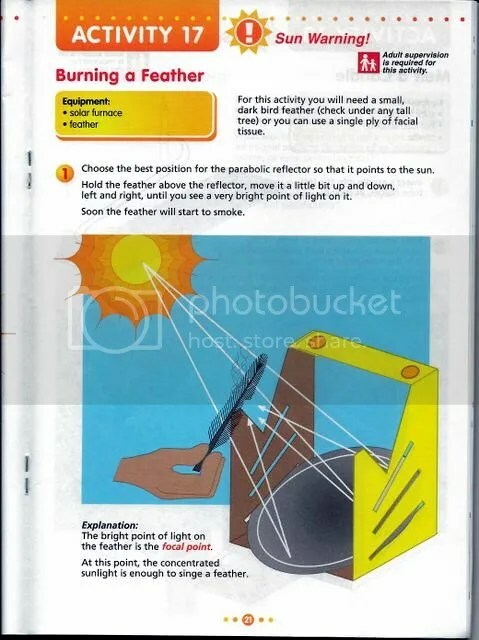 According to the booklet, solar furnace is a spherical parabolic mirror which reflects parallel light rays to a single point – the focal point. I had the kids test it out for themselves. They did feel the warmth. I had mentioned how neat it would be to try the burn a feather activity, but that it was too bad we didn’t have a feather. 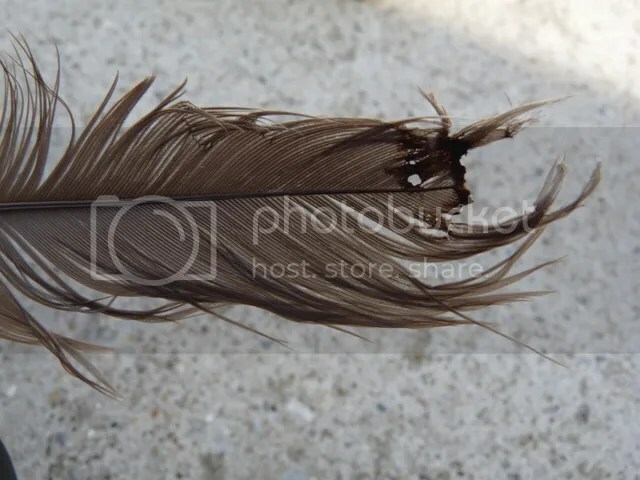 My daughter’s friend piped up, “I know where there is a feather!” And sure enough, she came back with a great one. 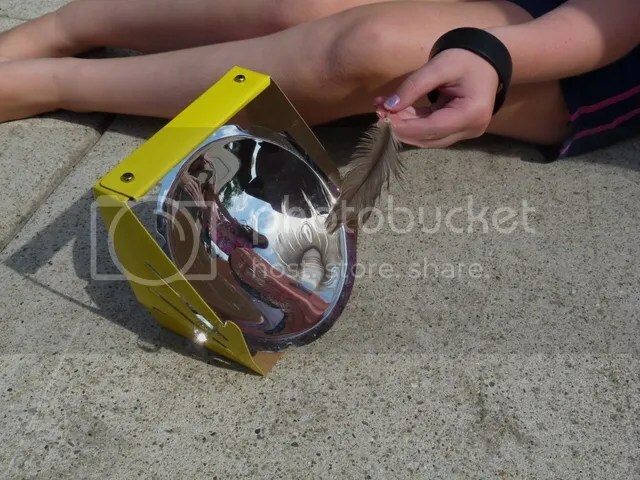 So we tried to use the solar furnace to singe a feather. For a while, I had my doubts because nothing was happening. But after a while of holding it steady, we were able to focus the light long enough and it started to smoke and singe the feather. It was so neat! 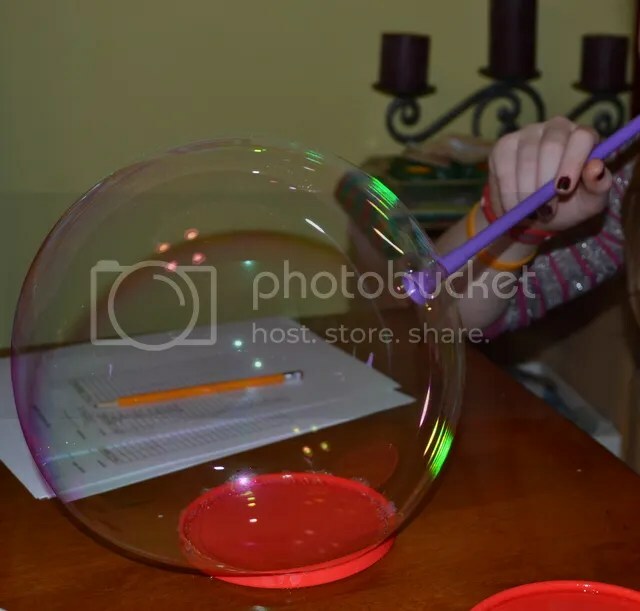 My 5th grade daughter had to do a science fair project this year and after much deliberation, decided on this project called The Invincible Soap Bubble, found at All Science Fair Projects dot com. 1. 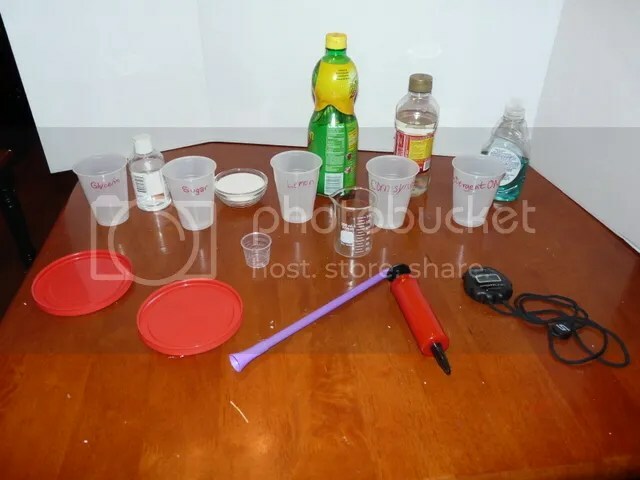 Using the marker pen, label the 5 plastic cups as “corn syrup”, “glycerin”, “sugar” , “lemon” and detergent only. 2. Each cup is filled with 100ml of tap water. 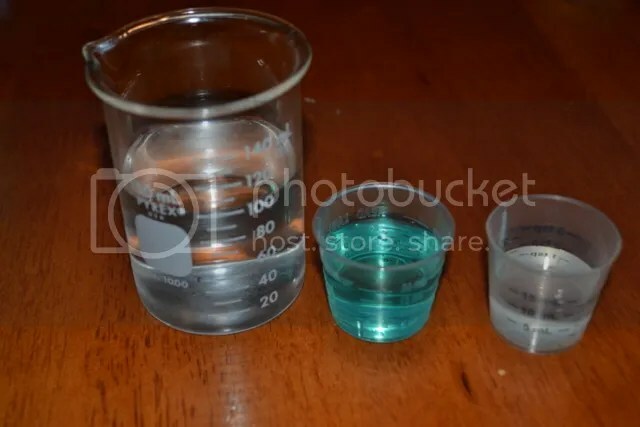 Another 20ml of liquid detergent is added to each cup and mixed with the water. Then 10 ml of corn syrup, glycerin, sugar or lemon is added to each cup and mixed once more. 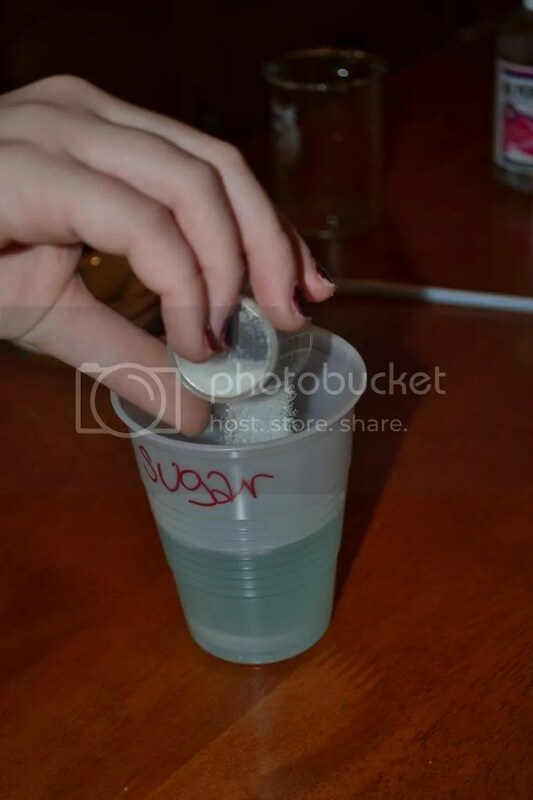 The cup marked detergent only is the control and it contains only a mixture of water and detergent. 3. The lid is wetted with the extra water. Then the straw is attached to the air pump and dipped into the solution briefly. 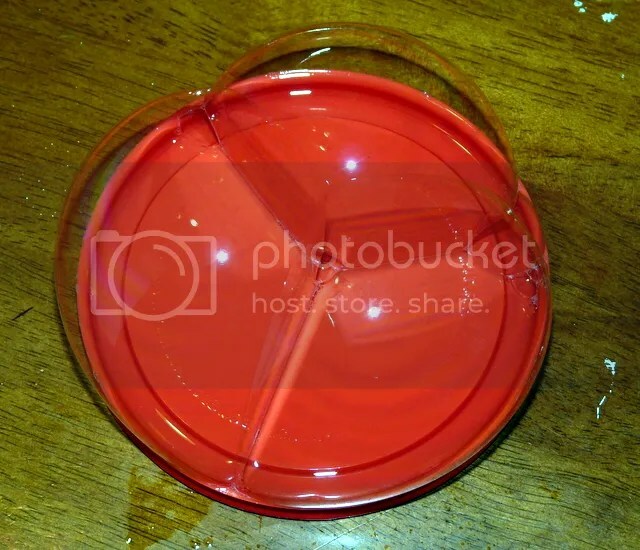 The pump will be pushed in and out and the bubble is blown to fill the lid. 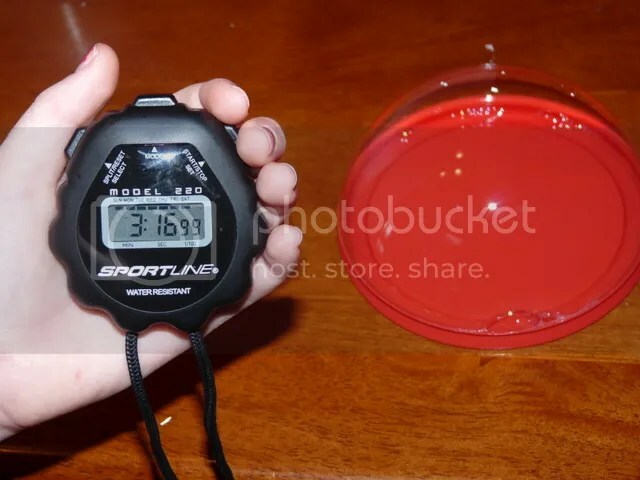 The stopwatch is started as soon as the straw is removed and it is stopped when the bubble pops. Record how long the bubble lasts before it bursts. Repeat this process for a total of 10 times. 4. Step 4 is repeated using the solutions in the other 4 cups and the times are compared to find the solution with the longest times. When the science project is done, calculate the average times for each additive and make a bar chart. Determine which bubble additive made the bubbles last the longest and the shortest. 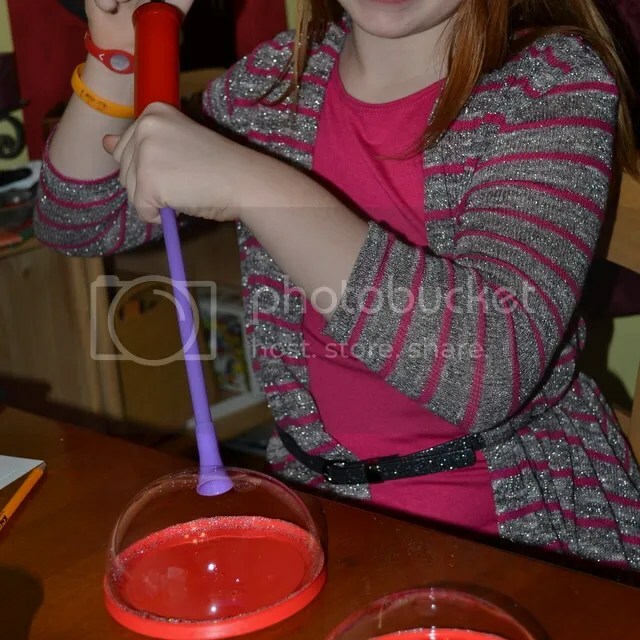 Quick answer: We found the additive which made the bubbles last the longest was glycerin. A bubble reflects color from its surroundings. When a light wave hits the surface of a bubble, part of the light is reflected back to a viewer’s eye from the outer surface and part of the light is reflected from the inner surface which is a few millionths of an inch further. As the two waves of light travel back, they interfere with one another causing what we know as color. When the waves reinforce each other, the color is more intense. When the wave get close to canceling each other out, there is almost no color. As a bubble wall gets thinner, either from a weak solution or because gravity has pulled its chemical content to the bottom, the distance between the inner surface and the outer surface of the bubble becomes less and less until the two reflected waves of light start to coincide and cancel each other out. 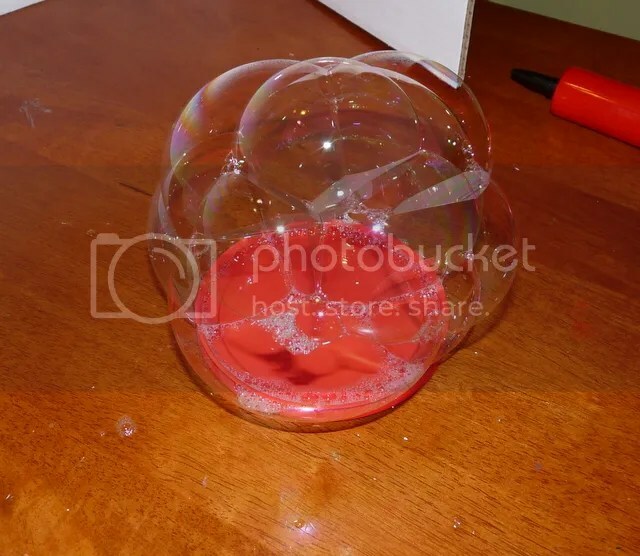 The result is that the bubble loses its color and can become nearly invisible. 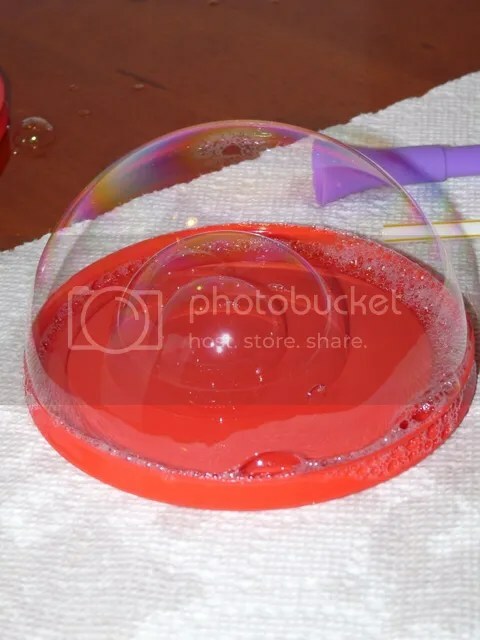 At what angle do bubbles join? Regardless of their relative sizes, the bubbles will meet the common wall at an angle of 120 degrees. This is easy to see in the bubble picture to the right. All three bubbles meet at the center at an angle of 120 degrees. Although the mathematics to prove this are beyond the scope of this article, the 120 degree rule always holds, even with complex bubble collections like a foam. Would you like to get your geek on and know the mathematical proof that 120 degrees is the correct answer? And if this isn’t enough geeky bubble fun for you, you can take a look at Project Gutenberg’s eBook of C.V. Boys SOAP-BUBBLES AND THE FORCES WHICH MOULD THEM. He delivered this bubble physics lecture over three days in the theater of the London Institution on December 30, 1889, January 1, 1890 and January 3, 1890 before a live juvenile audience. So, when is the last time your kids went to a physics lecture for inspiration? 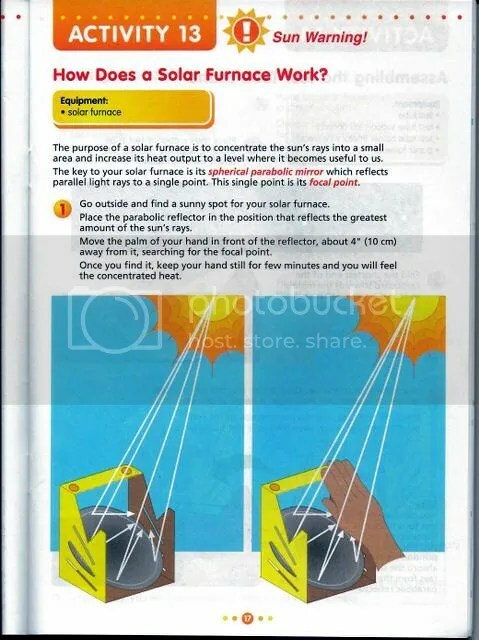 At the very least, I encourage you to take a look at that eBook and see the interesting and detailed hand illustrations. I think the next project we might try is experimenting with different shaped wire frames for experimenting with soap films (some designs of which were illustrated in C.V. Boys book). 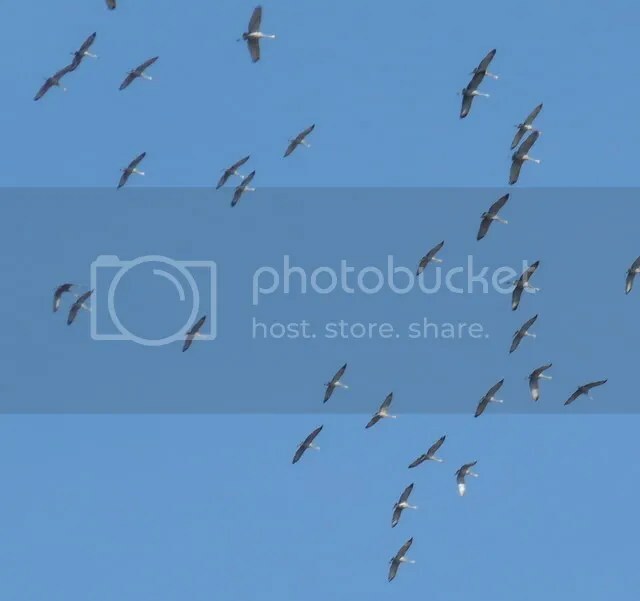 We witnessed a sandhill crane migration this morning. 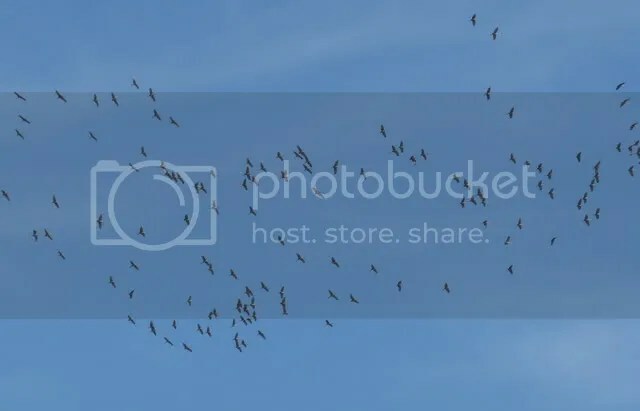 These birds flew rather crazy, kind of in a circular pattern and I don’t know why. It seems a very inefficient way of getting from point A to point B. They made a loud cooing call, which was crazy too. And this migration study being done at Ohio’s Department of Natural Resources. I think it’s pretty neat stuff. The last image is from March 8, 2012, just one week ago. There’s even a Crane Watch Festival in Kearney, Nebraska the week of March 23-April 1, 2012. You can check out Rowe Sanctuary Crane Cam for live footage. 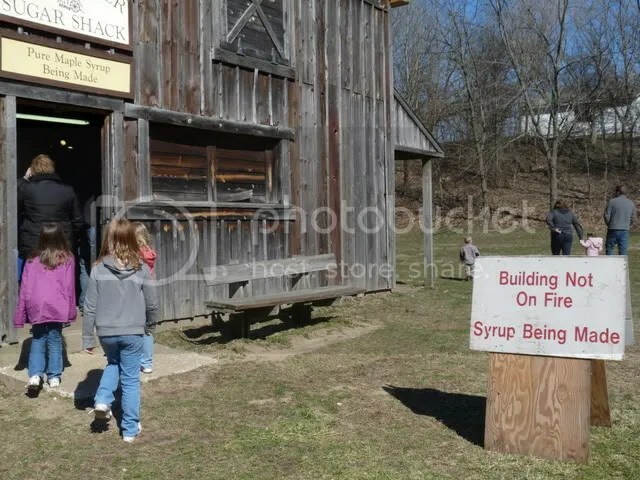 Long before you could go to your local grocery store and pick up a bottle of artificial maple flavored syrup made from corn syrup, sugar and a bunch of artificial stuff, people would collect the sap from maple trees. Maple syrup is a syrup usually made from the xylem sap for sugar maple, red maple, or black maple trees, although it can also be made from other maple species. 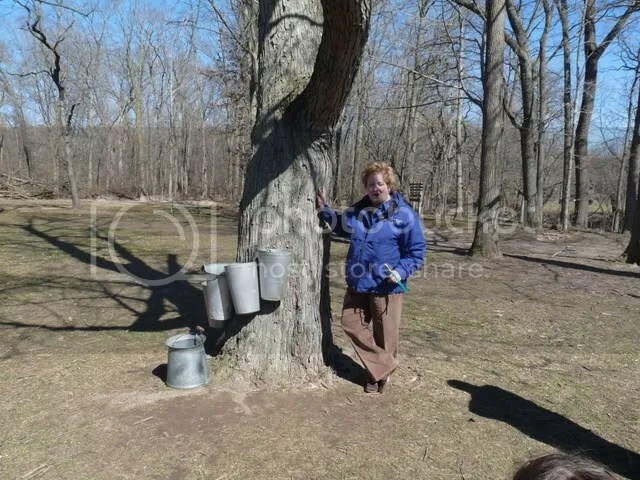 In cold climates, these trees store starch in their trunks and roots before the winter; the starch is then converted to sugar that rises in the sap in the spring. 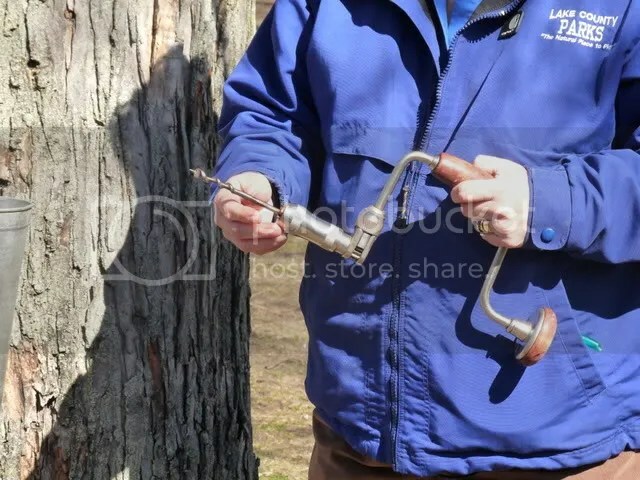 Maple trees can be tapped by boring holes into their trunks and collecting the exuded sap. 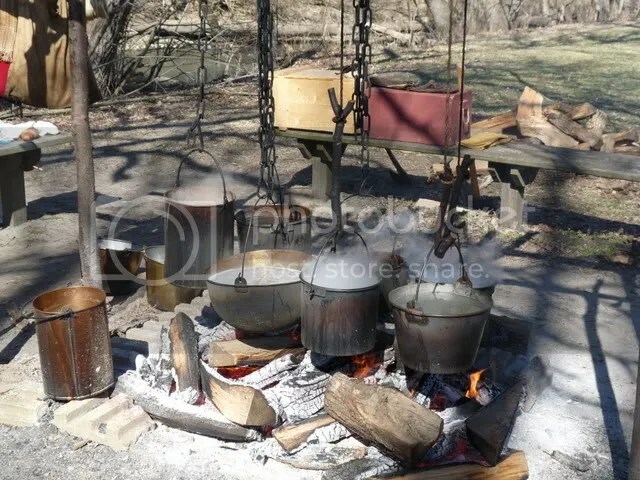 The sap is processed by heating to evaporate much of the water, leaving the concentrated syrup. 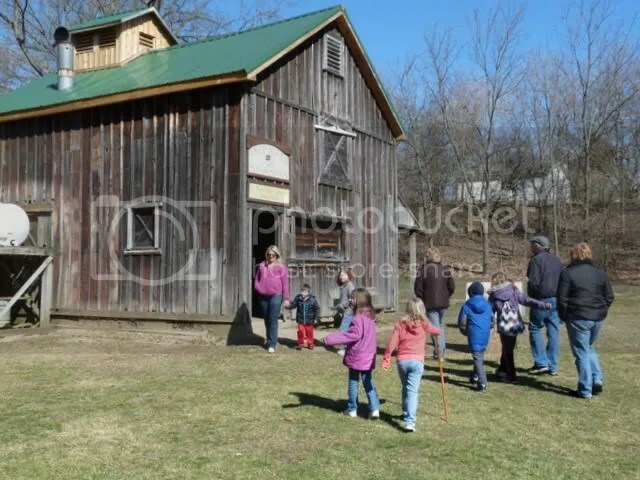 I’ve known about a local country park which has maple tapping events open to the public every March, but for the past few years, always seemed to miss it. I finally remembered ahead of time and so I took our daughters to see what it was all about. 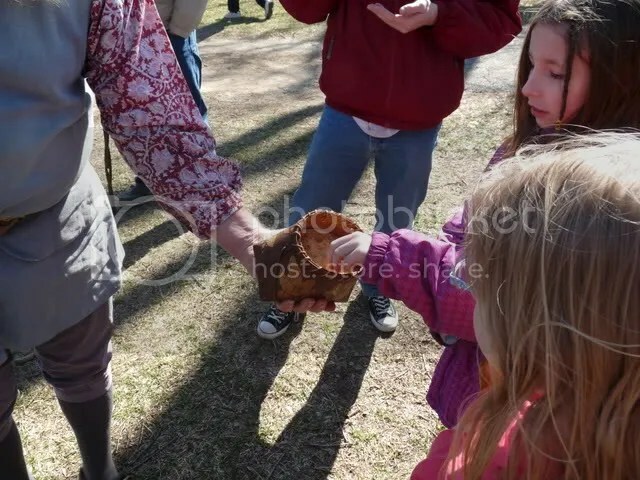 Our day started out with a 20 minute lecture of the process of tapping maple trees. We were told that the best time to tap a tree was when the nights were below 32 degrees and the days were above 32 degrees. 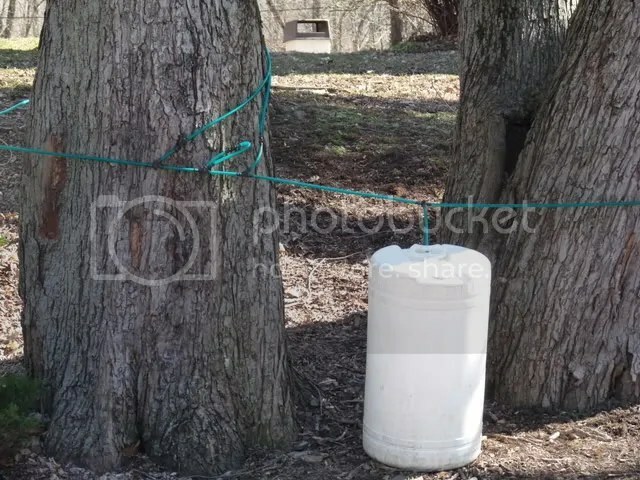 We were told that after selecting a tree of an appropriate diameter, they would drill into the trunk just deep enough to reach the xylem layer. At this point, the sap contains mostly water and about 3% sugar. They would then put a metal spile in the hole, though in the old days spiles were made from wood. 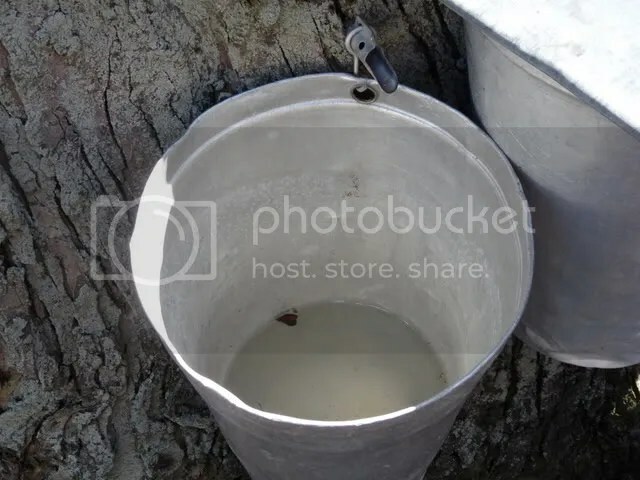 And then the sap would start dripping into buckets. They covered the buckets with lids to keep out rainwater and deter the deer, but sometimes bugs or leaves would get into the sap. That didn’t matter so much as the sap would get filtered and cooked down before becoming edible maple syrup. Traditional collection methods include a few buckets and spiles arranged in a stair-step pattern. 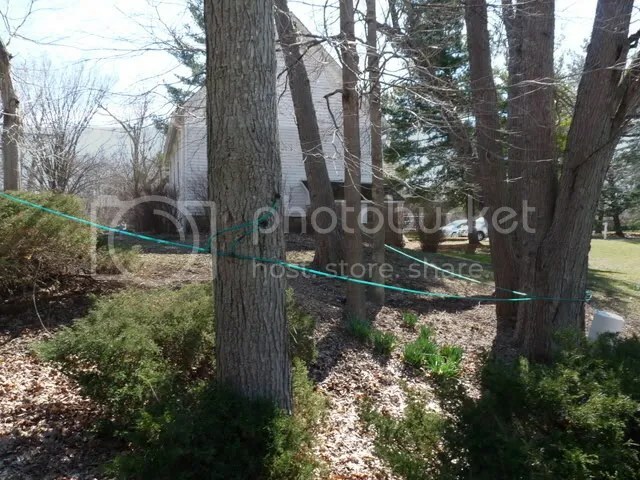 It was advised to not make the taps in a straight line around the trees, this is known as girdling and can harm the tree. 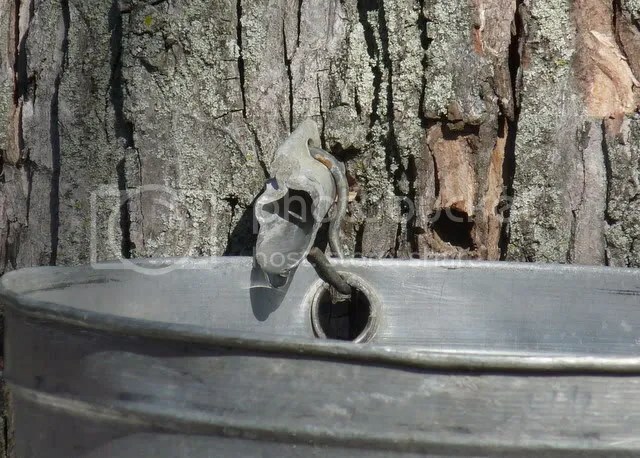 Newer methods of sap collection involved multiple spiles tapped into multiple trees and connected with a hose to collect the sap. This would all culminate in one large barrel. 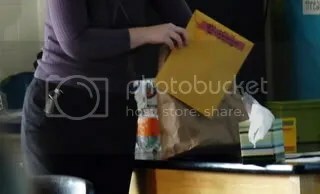 Of course, while this makes for efficient collection, in the back of my mind, I wonder if the plastics used are free of nasty chemicals. 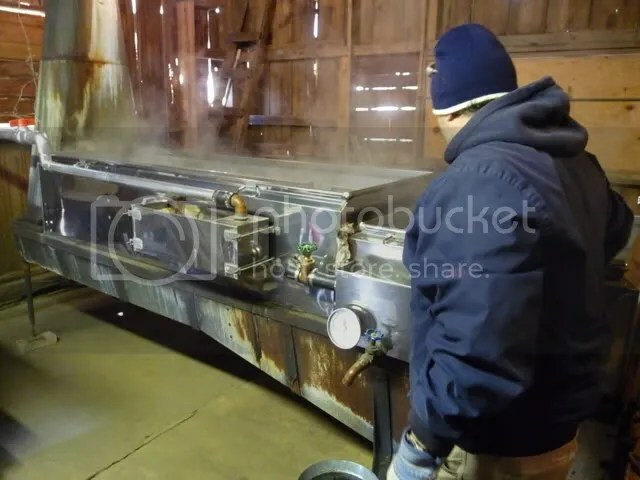 The maple sap would be taken to the “Sugar Shack” for further processing. We noted the warning sign with a smile before we proceeded inside. It takes about 40 gallons of tree sap to make one gallon of maple syrup, which explains why it’s so expensive. About 66 percent of the water needs to be removed to make maple syrup. 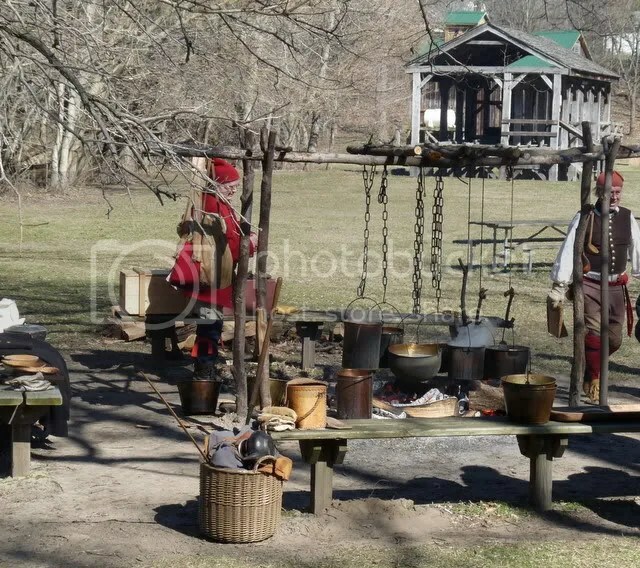 There were a group of historical re-enacters who dressed as 1700s Voyageurs that were making maple sugar over an open fire. All of the water needs to evaporate in order to make maple sugar. It was a very beautiful day, and very educational too. We went home with a couple bottles of maple syrup that they made. It’s been so long since I worked in forensic DNA, but I do keep up to date. Occasionally I get to give lectures to schools. 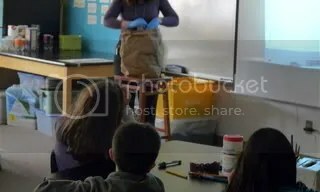 I gave one lecture to a class of first year biology students at a university before, but I still prefer giving lectures to elementary school kids like I did a few years ago. It’s so much more fun. The forensic DNA talk I gave turned out well, and despite low lighting, overhead projector difficulties from time to time and a bad hair day. I have some fuzzy photos from the forensics talk. I asked my husband to be my papperazzi. Because I knew it would make a great blog post. 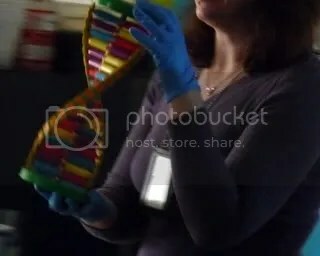 This is a great DNA model (CSI DNA build kit from Planet Toys) I purchased and put together with my fourth grade daughter for her class. Pretend evidence – I had a few types of mock evidence: a blood tube, bloodstains on a mini-blanket, swabs and, hair and fiber evidence. I’ll take pictures of them later and post them. I’m sure I’m saying something really cool in this photo. The talk went really well, I had a good time and I used great comedic timing whenever possible, ESPECIALLY when I made a mistake or I had a technical difficulty. Works as a nice distraction and gives me breathing room. I explained to them how DNA is tested in the forensic lab and how I help put criminals in jail and how I help other people who were wrongly convicted get out of jail with my tests. One of the girls raised her hand and I thought it was a question. Instead she said, “so, you’re like a hero ? !” (I thought that was so nice). Well, yeah, I guess I was. The kids asked great questions and enjoyed the interactive approach – I passed around my visual aids so the kids got to see them close-up. After my lecture, I asked them if they thought they wanted to be forensic scientists when they grew up. I was tickled when about 8 of them (a lot of them girls) raised their hands enthusiastically. I was really glad to hear a lot of the kids enjoyed the talk, and when I asked my daughter if I embarrassed her at all (which was a worry she had two days ago), she said “no” and she thought it was cool. The teacher thought I did such a good job, we got to take the class rat home. Actually the rat had nothing to do with the lecture. We are rat sitting over the long winter break weekend. 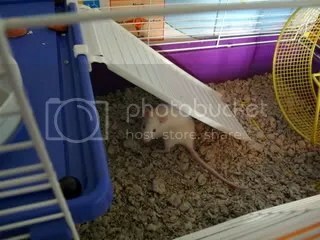 They are doing an experiment with two rats at school.